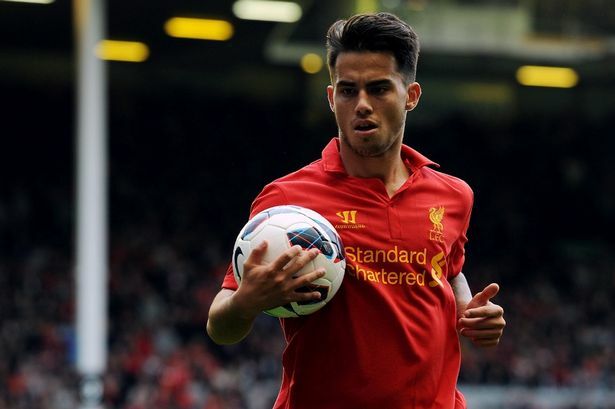 Suso’s appearances for Liverpool have been limited recently. Liverpool youngster Suso put in a very promising performance on Tuesday night as he represented Spain Under 21s against Belgium. The video compilation below, brought to our attention by Liverpool Kop, shows the highlights of some of his stunning play throughout the match. He had made 23 appearances for Spain at youth level and made his debut for the Under 21 side against Italy last November. Spain won that game 3-1 but could only manage a draw against Belgium with both sides grabbing a goal each. He displayed some ‘Messi’ like qualities when he was running towards the edge of the box. Besides his assist that led to the goal, there was one assist, where he lobbed the ball up, I felt the striker should have scored that. That particular assist sort of reminded me of the Carlos Vela goal against Bolton (in Aug/Sept 2010) when Fabregas lobbed it up in a similar fashion. Nice compilation. His assist that did not lead to the goal. The one where he lobbed the ball up to the striker. It sort of reminded me of that Carlos Vela goal against Bolton (Aug/Sep 2010) when Fabregas did a similar thing.